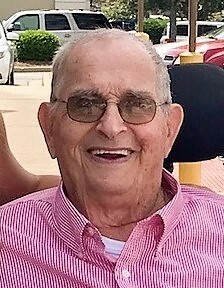 William Don Gosnell, 83, husband of Patsy Allison Gosnell, of Greenville, died Wednesday, April 10, 2019. Born in Greenville County, he was a son of the late William Fred and Earline Curry Gosnell. Don was a member of Hampton Heights Baptist Church and attended Clemson University. He was the owner and operator of Gosnell’s Garage. In addition to his loving wife of 62 years, Don is survived by three sons, Roger Dale Gosnell of Greenville, Bryan Alan Gosnell of Greenville, and Joe Frederick Gosnell (Joy) of Fair Play; five grandchildren, Brendle Rubert (Jimmy), Jodi Ann Gosnell, Jordan Gosnell, Eli Gosnell, and Sam Gosnell; a sister, Marcia Purcell of Fair Play; and a brother, Ronald Dean Gosnell of Greenville. Visitation will be held Monday, April 15, 2019 from 10:30 a.m. until 11:45 a.m. at Thomas McAfee Funeral Home, Downtown, with the funeral service to follow at 12:00 p.m. in the Downtown chapel. Burial will be held in Woodlawn Memorial Park. In lieu of flowers, memorials may be made to Regency SouthernCare, 880 S Pleasantburg Dr. Ste. 1A, Greenville, SC 29607.